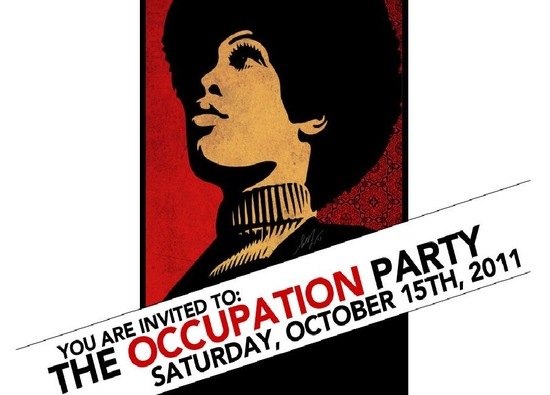 Carol's Closet: Is Angela Davis Symbolic of Occupy Wall Street? 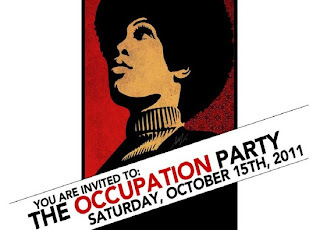 Was Fairey thinking of Angela Davis when he created the invitation? 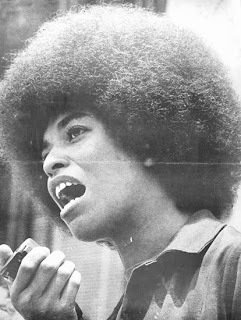 Davis, the Communist party member and candidate, former member of the FBI's Ten Most Wanted Fugitives list (for killing a judge, no less), hero of Cuba, and former Black Panther would be a perfect poster child for OWS. Ms. Davis has spent a lifetime disparaging, and calling for the destruction, of the country that gave her the opportunity to go from the little black girl living in "Dynamite Hill" to a Distinguished Professor in the Women's and Gender Studies Department at Syracuse University. The participants of OWS are members of the "Gimme Generation". They are throwbacks to the spoiled, privileged children of the Sixties. I don't know if Fairey was thinking of Davis or not, but I certainly agree that Davis in symbolic of the selfishness embodied by the Occupy Wall Street protesters. Even more, Angela Davis is a symbol for all those college grads who majored in Women's and Gender Studies, owe thousands of dollars in student loans, and can't get a job. Yep, perfect for OWS. Woke up one day and decided I'd better start paying attention. Found out that there is a direct correlation between paying attention and ulcers. The ulcers don't bother me. Fortunately, my parents credo was "Don't let the bastards get you down!" I never have. NY Times: The socialism of Bernie Sanders isn’t really socialism - "He’s really concerned about the social contract..." The post NY Times: The socialism of Bernie Sanders isn’t really socialism appeared first on Hot Air. AT AMAZON, save in Sports Nutrition. Plus, deals on Office and School Supplies…. - AT AMAZON, save in Sports Nutrition. Plus, deals on Office and School Supplies. Sayonara Ohio: The Democrats' Buckeye Blues - Ohio is the swing state which might not swing left anymore -- and Democrats have no one to blame but themselves. National Catholic Register - Will there be donuts? Homicide? - . My, my, my! . Obama Nominates First Gay Secretary of the Army - Beyond Parody. But not beyond Mockery. Is This Thing Still On? - From 2009 to 2015. We've come a long way, baby! [Quark's rule] When Mom leaves, it's all over.